The Alder is a detached bungalow situated on a beautiful setting overlooking Killarney’s Lower Lough Leane, known for Salmon and Trout fishing. Boats are available from the proprietor to enable you to enjoy both fishing and touring the beautiful lake. There is three bedrooms in the house, the first bedroom has a double and a single bed, the second room has a double bed and the third room has twin beds. The house can accommodate a party of 7 people. There is a main bathroom with shower and the master bedroom is en-suite. The Alder is equipped with all modern conveniences, washing machine, dishwasher, tumble dryer, fridge freezer, microwave and colour television. The house also has oil fired central heating and an open fire in the sitting room. There is private parking at the house. The Alder is located just 5km from the famous Gap of Dunloe and is a five minutes drive from local restaurants and pubs. It is an ideal base for golfers as there is a choice of 9 or 18 hole courses in the area. The Alder is located 10km from Killarney town where a wide range of outdoor pursuit activities are available to suit all the family. Killarney town has much to offer the visitor, the beautiful Lakes of Killarney, Muckross House and the National Gardens. The Alder is ideal for touring the Ring of Kerry, the Dingle Peninsula, North Kerry and County Cork. 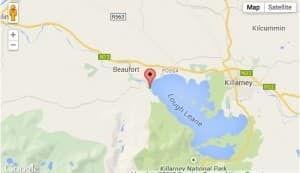 Take the N72 road from Killarney town and after 3 miles take the left hand turn for the Gap of Dunloe. Take the first left on The Gap of Dunloe Glencar road and at the next junction turn left and follow The Invicta sign.